The l’il robot on the left is my character Cog and the super-hott dame on the right is Big Barda, my favorite character from DC’s New Gods. YOU’RE THE MAN, DUSTIN! Be sure to check out his Deviant Art gallery, and go buy all his issues of Detective Comics, available in finer comic book stores now! BONUS POST: Links to Awesome Stuff! ITEM! 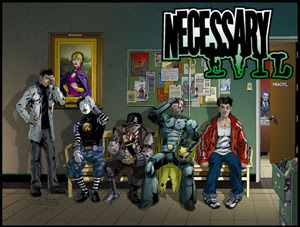 Newsarama, one of the premier comic book news sites on the web, posted an interview with Josh about Necessary Evil! Check it out here. ITEM! 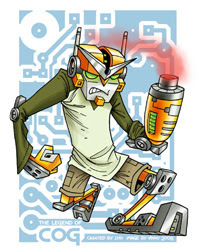 Vinny drew an awesome pin-up of my character Cog! 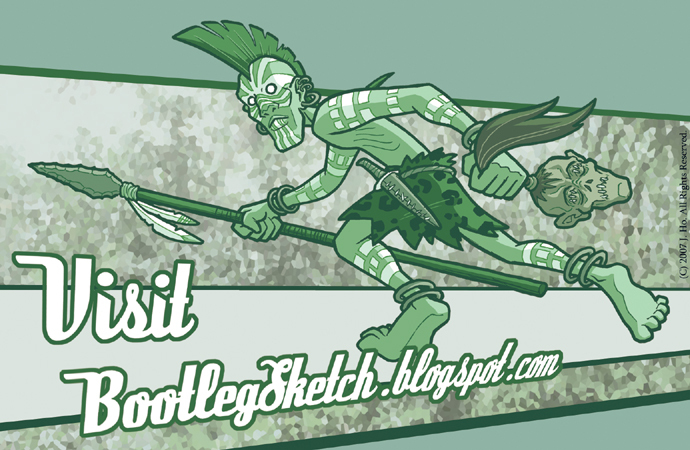 Check out Vinny’s post here and be sure to check out the rest of his sketchblog! I will be at Comic-Con International in San Diego from July 25-29, You will be able to find me at the Big Boss Comics table in the small press area. Our table number is N10. And please visit our friends, the Tired Girls at table N4. As promised, I have two illustrations to cover the week’s posts, which simultaneously act as plugs for my convention projects. Convenient and diabolical, yes? Click images for larger view. The first up is the cover of the sketchbook that I’ll be selling. The lovingly rendered characters on that cover are (from left to right) Mer-Man astride Panthor, Whiplash, and Beastman, as rendered by me when I was about 9-years-old. 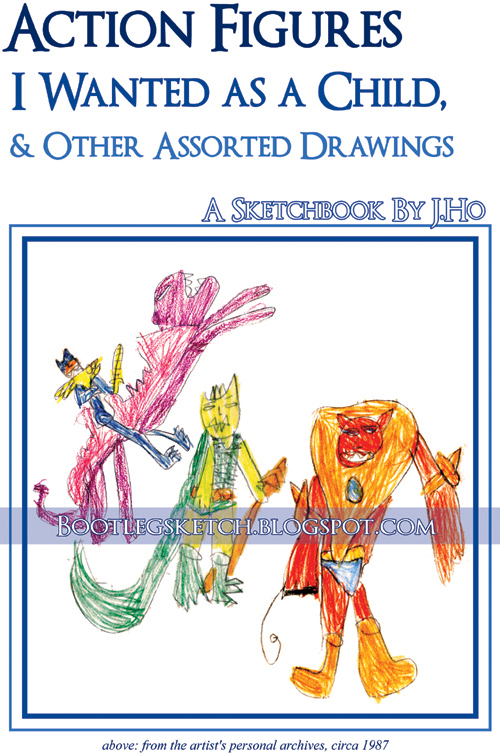 The guts of the sketchbook, however, contain my modern day work–including a lot of uncolored line art from the sketches that go up on this blog, but also debuting a number of pieces that have yet to appear. The sketchbook, titled Action Figures I Wanted as a Child, & Other Assorted Drawings, is 40 pages, with color cover and black and white interiors, and sells for a mere $5. FYI, the real version of the cover doesn’t have the watermark with the blog URL across the cover. 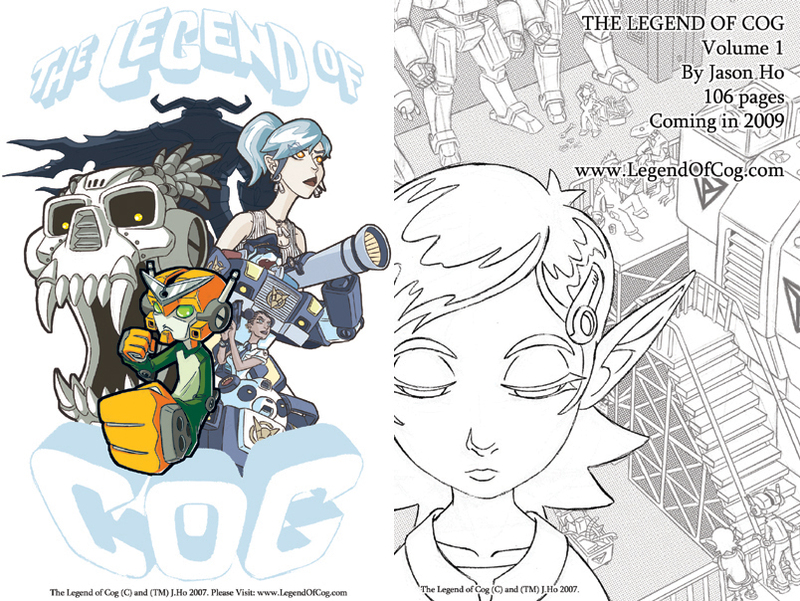 Next up, is art from both the front and back of a free promotional postcard for my comic-in-progress, The Legend of Cog. For more on the progress and status of Cog, please check out the website (and you can read the first 8 pages for free). I will also be selling copies of the first “issue” of The Legend of Cog, which is basically a black and white ashcan preview that gives you the first 24 pages of the story. The ashcan goes for the neglible price of $1. In addition to the Cog postcard, I also put together a free promotional postcard to promote this very blog. The art, of course, is taken from this post, which I spruced up with some type and background elements. Beyond my personal projects, I’ve got some stuff going on with the day job, as well. One of the give-aways at the Bongo Comics booth will be a mini-comic promoting the return of Futurama. I penciled the comic over Bill Morrison’s layouts. My tablemates from Big Boss Comics have got plenty of goods too. First up is the Big Boss Comics Was Here anthology. For a measly $10, you get 100 whopping pages in black and white, with a gorgeous color cover by Andrew Tunney. The Kid Justice story I mentioned a few posts ago is in there, with a humble “cover” by yours truly, and awesome interior art by Vinny. 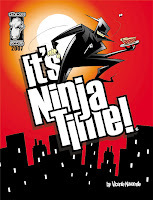 Speaking of Vinny, he’ll be selling the latest issue of It’s Ninja Time, a quirky action-packed comic that I dearly love. 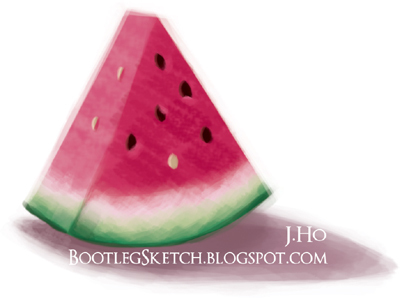 Vinny will also be selling color sketches, many of which you can see on his blog. And don’t forget about the Tired Girl Collective. They were quite a hit last year, and they’re back for more. Jodi will be packing buttons and various hamster-related paraphenelia. 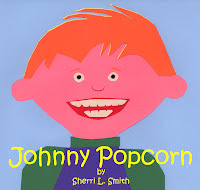 Sherri will have a book called Johnny Popcorn and a book called Momfight! (Surely, your interest must be piqued by now!) 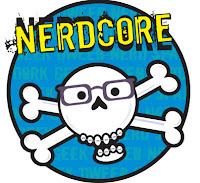 And Ren will be there with clever and surreal cards, nerdcore totebags (see below), shrinky dinks (yes really), and more! Phew–I’m off to the convention! Back to the normal hi-jinx next Tuesday. Have a great week everyone! Just a quick little pen sketch, with some Photoshop colors slapped in. Anybody remember this little guy? 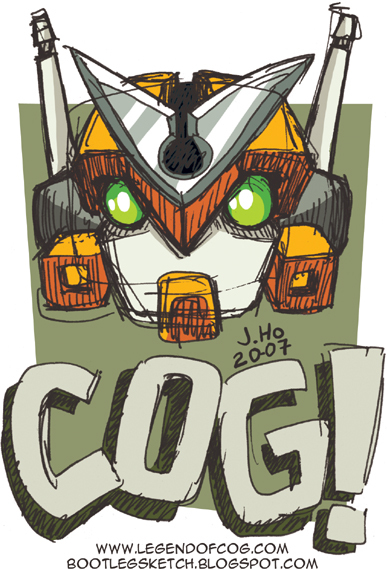 Not an obscure 80′s cartoon, not a hoax, and not a fever dream–it’s Cog, the title character of The Legend of Cog, an ashcan comic that I sold at Comic-Con in 2006. Basically the 24-page mini-comic is the lead-in to a much larger story which, theoretically, will see the light of day within the next couple of years. You can read the first eight pages at http://www.legendofcog.com/. Unfortunately, that website has been horribly neglected (as has Cog) for the past year. Again, theoretically, I should be updating that site soon. There won’t be a new issue of Cog at this year’s convention, but I am pretty busy working on a few other things for the convention–a sketchbook, and two give-away postcards (one of which features Cog himself). I’ll post more about that stuff and talk a little bit about where I’m at on The Legend of Cog as the convention gets closer.